(Nanowerk News) Graphene, a one-atom thick sheet of carbon atoms arranged in a hexagonal lattice, has many desirable properties. Magnetism alas is not one of them. 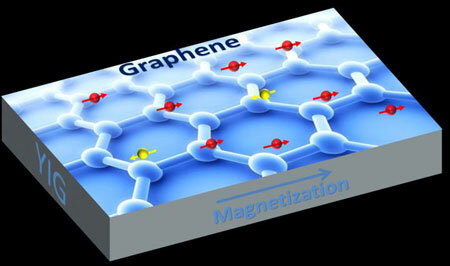 Magnetism can be induced in graphene by doping it with magnetic impurities, but this doping tends to disrupt graphene's electronic properties. Study results appeared online earlier this month in Physical Review Letters ("Proximity-Induced Ferromagnetism in Graphene Revealed by the Anomalous Hall Effect").